LUCKY. (DVD Artwork). ©Magnolia Pictures. 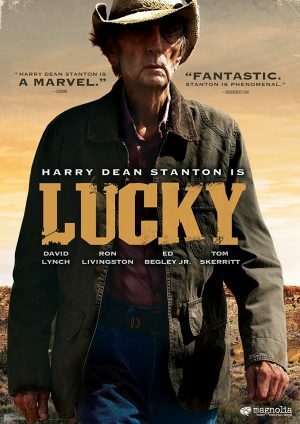 Actor Harry Dean Stanton (Paris, Texas, “Twin Peaks”) delivers a memorable final performance in “Lucky,” arriving on DVD Tuesday Jan. 2. Helmed by actor John Carroll Lynch’s (“Fargo,” “American Horror Story”) making his directorial debut, “Lucky” features Stanton in one of his only starring roles in a career that spanned over 200 films since the 1950s. The drama follows the spiritual journey of a 90-year-old atheist and the quirky characters that inhabit his off-the-map desert town. Having outlived and out-smoked his contemporaries, fiercely independent Lucky (Stanton) finds himself at the precipice of life, thrust into a journey of self-exploration, leading towards that which is often unattainable—enlightenment. With an all-star cast including four-time Oscar nominated director David Lynch (“Twin Peaks”), Ron Livingston (“The Conjuring”), Beth Grant (“The Mindy Project”), Ed Begley, Jr. (“St. Elsewhere”) and Tom Skerritt (“Picket Fences”), the film is a love letter to the life and career of Stanton, who died September 15, 2017 at the age of 91. It also is a meditation on mortality, loneliness, spirituality and human connection. The DVD is available for a suggested retail price (SRP) of $26.98. The 88-minute film is unrated. Andy Lau (“House of Flying Daggers”), one of Hong Kong’s most commercially successful actors, headlines the exciting thriller “Shock Wave,” arriving on Blu-ray and Digital Tuesday Jan. 2 from Cinedigm and Crimson Forest Films. Written and directed by Herman Yau (“IP Man: The Legend Is Born”), with both Yau and Lau as producers, the spellbinding action film captured the top box office spot in China and Hong Kong when it hit theaters in 2017. Made for only $23 million, “Shock Wave” became Hong Kong’s second-highest grossing domestic film in 2017. 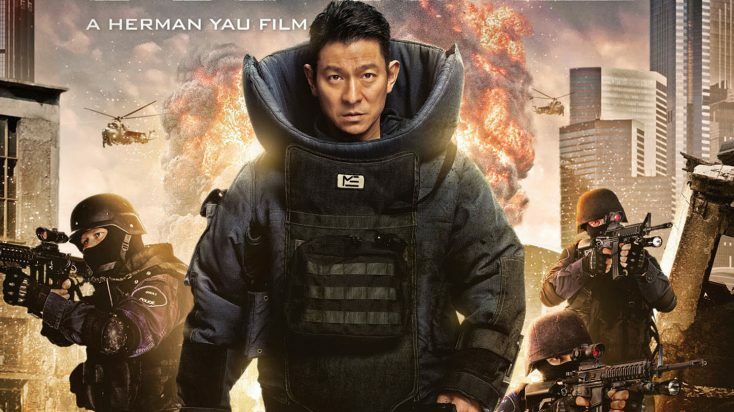 Set on the busy streets of Hong Kong, Lau stars as Cheung Choi-san, a bomb disposal expert working to protect his city from attack. When a terrorist who specializes in explosives, Hung Kai-pang (Jiang Wu, “A Touch of Sin”), takes hold of the busy Cross-Harbor Tunnel, he threatens to kill hostages if his demands are not met. The third collaboration between Yah and Lau, “Shock Wave” is available on Blu-ray and DVD Combo, which includes an exclusive behind-the-scenes look at the making of the film, including an interview with Lau. The Blu-ray and DVD Combo is available for an SRP of $22.97; the DVD only is available for an SRP of $16.97. Up and coming rapper Azealia Banks stars with an acclaimed cast in “Love Beats Rhymes,” an inspirational film about finding a voice and passion through Slam poetry. The film is directed by RZA, and boasts an all-star cast that includes Jill Scott, Lucien Laviscount, Hana Mae Lee and Common. When struggling rapper Coco (Banks) enrolls in a poetry class, she thinks her rhymes will impress her teacher, Professor Dixon (Scott). Instead, Dixon challenges Coco to seek real meaning in her lyrics, setting her on a journey of discovery that takes her through rap clubs and poetry slams, leading her to find her true voice—and true love —in this uplifting movie. RLJE Films has released the action, horror film “Mayhem” on DVD, Blu-ray, and Ultra High-Definition 4K/Blu-ray combo. Directed by Joe Lynch (“Everly,” “Chillerama”), the feature film debut from writer Matias Caruso stars Steven Yeun (“The Walking Dead,” “Okja”), Samara Weaving (“Three Billboards Outside Ebbing, Missouri”) and Steven Brand (“Secrets and Lies”). Derek Cho (Yeun) is having a really bad day. After being unjustly fired from his job, he discovers that the law firm’s building is under quarantine for a mysterious and dangerous virus. Chaos erupts throughout the office as the victims of the disease begin acting out their wildest impulses. Joining forces with a former client (Weaving) who has a grudge of her own, Derek savagely fights tooth and nail to get to the executives on the top floor and settle the score once and for all. The DVD, Blu-ray, and Ultra High-Definition 4K/Blu-ray combo includes the bonus features “Creating ‘Mayhem’—The Making of the Film,” an audio commentary with director Lynch, director of photography Steve Gainer, editor Josh Ethier and more. “Mayhem” is available on DVD for an SRP of $27.97, on Blu-ray for an SRP of $29.97 and on Ultra High-Definition 4K/Blu-ray combo for an SRP of $35.97. RLJE Films is set to release the horror film “The Houses October Built 2” on Blu-ray and DVD Tuesday Jan. 2. The sequel to the 2014 cult hit marks the return of Brandy Schaefer (Coffin Girl from “The Houses October Built”), Mikey Roe, Jeff Larson along with the original filmmaking team of director and co-writer Bobby Roe, producer and co-writer Zack Andrews​​, and producer Steven Schneider (“Split,” “Insidious”). Recovering from the trauma of being kidnapped last Halloween by the Blue Skeleton—a group who take “extreme haunt” to another level—five friends decide they must face their fears in order to move on. Heading back out on the road to visit more haunted house attractions, signs of the Blue Skeleton start appearing again and a new terror begins. “The Houses October Built 2” Blu-ray and DVD have bonus features that include deleted scenes, uncut projection scene, Portrait of a Scare Actor 2 and “Halloween Spooks” music video. The film will be available on Blu-ray for an SRP of $29.97 and on DVD for an SRP of $27.97. “No Solicitors,” a campy horror with political satire starring Eric Roberts (“The Dark Knight,” “The Expendables”), comes to DVD and Digital Tuesday Jan. 2. Lewis Cutterman (Roberts) is a well-respected brain surgeon and happily married with two beautiful children who run the family business. The Cuttermans are model citizens within the community. A simple visit to their home by a solicitor is greeted by an invitation to dinner; except dinner takes a macabre turn when the solicitor finds himself drugged by the family. Waking up, the solicitor soon discovers they will be slowly eaten piece by piece and that the kid’s family business is to farm out their internal organs to needy patients. Written and directed by John Callas, the film also stars Beverly Randoloh (“The Return of the Living Dead”), Kim Poirer (“Dawn of the Dead”) and Felissa Rose (“Sleepaway Camp”). The DVD is available for an SRP of $14.93.